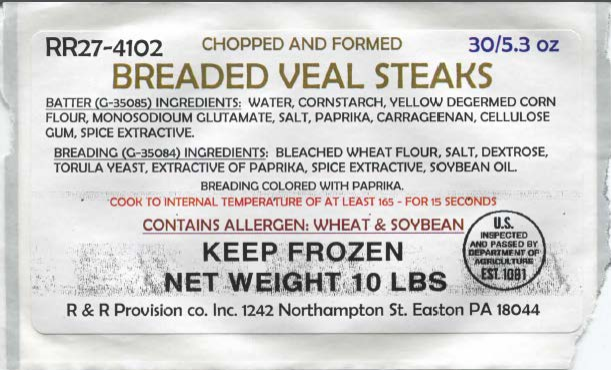 R&R Provision Company Inc., an Easton, PA company, has issued a recall notice for approximately 23,040lbs of breaded veal products due to misbranding and undeclared allergens, the U.S. Department of Agriculture’s Food Safety and Inspection Service (FSIS) announced today. The products contain whey and non-fat milk, allergens which are not declared on the product label. 5.3-OZ. Plastic sealed packages containing 30 pieces of “BREADED VEAL STEAKS” bearing package code RR27-4102. 7.5-OZ. Plastic sealed packages containing 20 pieces of “BREADED VEAL STEAKS” bearing package code RR27-4142. 5.3-OZ. Plastic sealed packages containing 30 pieces of “BREADED VEAL STEAKS” bearing the package code RR27-4122. 4-OZ. Plastic sealed packages containing 40 pieces of “BREADED VEAL STEAKS” bearing the package code RR27-4132. 4-OZ. Plastic sealed packages containing 30 pieces of “BREADED VEAL PATTIES” bearing the package code RR27-4092. 5.3-OZ. Plastic sealed packages containing 40 pieces of “BREADED VEAL PATTIES” bearing the package code RR27-5002. The labels of these products can be viewed here. They all bear the establishment number “EST. 1081” inside the USDA inspection mark. They were shipped to restaurants in Pennsylvania and New Jersey and sold at the company’s retail store. The issue was first discovered by FSIS inspection staff during a routine labelling verification. R&R Provision Company had received notice from their breading supplier about new ingredients being included, but had not incorporated the change on their product labels. There have been no confirmed reports of adverse reactions to the products thus far, but consumers who have purchased these products should dispose of them or return them to their place of purchase.